Strathmore Cold Press Watercolor Pads - One of the best known and most trusted names in fine art papers! These pads are acid free, cold press, 140lb paper. Each pad is wire bound at the top and has 12 sheets. 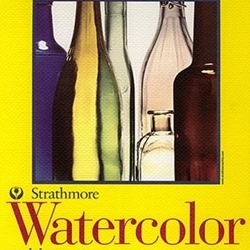 A great way to get started with watercolors, experiment with a new technique, or bring to class or out on the field. This paper is suitable for professional, beginner, and student use alike. It is very durable - David Hoffend, one of our resident artists, has even used this paper to do artist's proofs with etching!